The grandson of a Methodist Preacher, Orvon Grover Autry was born on September 29, 1907 near Tioga, Texas. After high school Gene worked as a laborer for the St. Louis and San Francisco Railroad in Oklahoma. In 1928 he began singing on a local radio station, and three years later he had his own show and began making his first recordings. He became known as The Singing Cowboy, a true Silver Screen Legend. This set features Gene Autry, the famous Singing Cowboy, in four of his classic films. 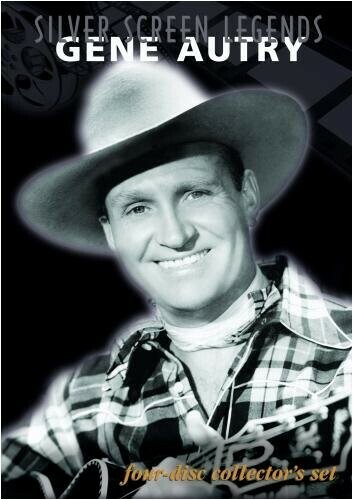 A famous cowboy disappears and Gene Autry, his double, impersonates him. He sings and herds cattle on his famous horse Champion but the hoax becomes problematic when blackmailers discover the truth. Gene and Frog set out to find out who has been causing accidents at a dam construction site. Gene, with Frog, heads for South Africa where his brother Tex has found diamonds and has gone missing. Heading into the jungle, they find that Tex is a prisoner and Gene quickly finds himself a prisoner too. When Gene is hired to deal with a moth infestation that threatens a protected forest, he comes into conflict with Lumber men who are cutting down the restricted timber.